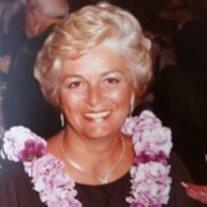 Phyllis Ann Pittmon of Mesa fell asleep in death January 17, 2014. She enjoyed a full life despite a long history of heart disease. To the very end she was sassy and spunky and fun loving. She leaves behind many fond memories for family & friends. Those who miss her include her husband Bill, daughters Vicki & husband Tony Pitmon, Sharon Rose, Tina & husband Joel Smith; also Laurie & Dan Price, David & Lisa Pittmon, Judy Kessler, Darryl Pittmon and Darin Pittmon; 27 grand & great grandchildren. She leaves her older siblings, Kenneth Pasano, Rose Butler and Anthony Pasano to carry on the legacy of their parents, Anthony and Eleanor Pasano. Phyllis will be memorialized at 3 p.m. on Monday, February 24th at Bunker’s University Chapel, 3529 E. University Dr., Mesa AZ 85213. A reception will follow at Sunland Village Golf Club on Rochester & Delta in Mesa. The family asks that in lieu of flowers, donations be made in her honor to Hospice of the Valley, 2020 E. Woodside Ct, Gilbert AZ 85297.